Here's another side-tear check style in popular plaid, done up in a warm blend of bright yellow and green gingham. This is the right choice if you love vibrant colors and classic design! 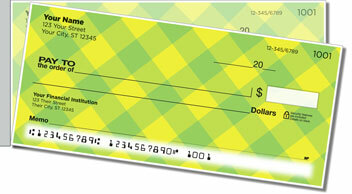 With our Yellow Plaid Side Tear Checks in your purse or pocketbook, you can spread a little spring-like cheer every time you write a check. Best of all, you won't waste as many documents due to accidental rips, thanks to the short perforation on the left, which lets you separate completed checks quickly and cleanly from the pad. So hurry -- order your very own set of Yellow Plaid Side Tear Checks and matching address labels today!